ShadowPlay is an extra functionality that allows the owners of compatible Nvidia Kepler-based graphic cards to take advantage of the built-in H.264 encoder to record gameplay video with hardware acceleration directly into small in size MP4 video files. 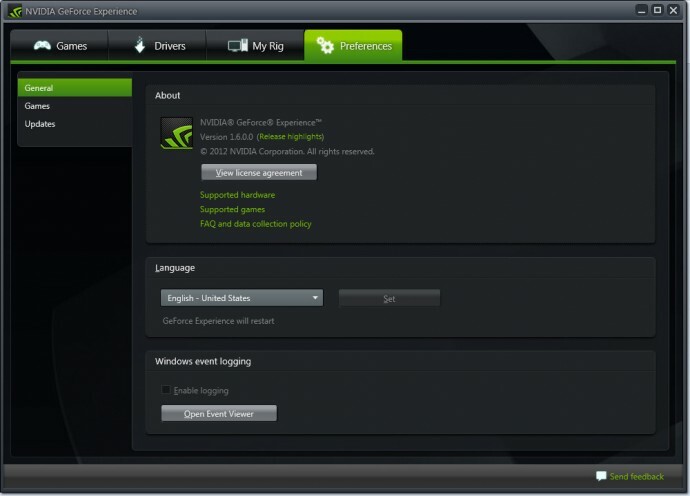 ShadowPlay is a part of the GeForce Experience software that now comes as a part of the Nvidia video drivers, and although it is still in Beta stage it looks quite promising. 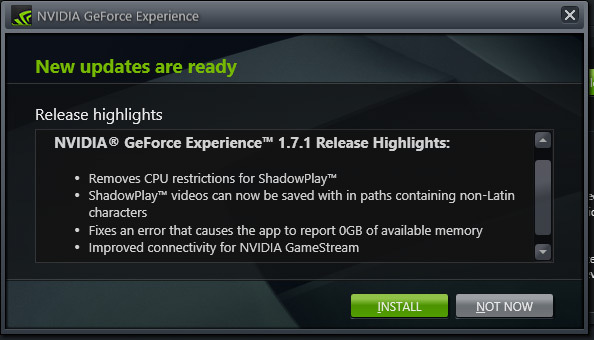 And while ShadowPlay was introduced last month with the release of the GeForce Experience 1.7 software I still haven’t been able to try the software, but now I can and since Nvidia just released a new GeForce 331.82 WHQL video driver that comes with an update to GeForce Experience 1.7.1 it is time to try out this feature. Aside from the new version of the Geforce Experience software the new video drivers also come with a 3D Vision profile for the game Assassin’s Creed IV: Black Flag and it is rated as “Good” for playing in stereo 3D with 3D Vision setups. Looking at the ShadowPlay interface you can easily see that it is designed with the normal users in mind, by providing you with a simple and easy to understand clickable buttons for configurations. But more advanced users like me will miss some simple things like an option to remap the default ALT + F9 key combination for manual start/stop of the recording for example or an option to control the recording resolution or framerate and so on. Hopefully Nvidia is going to add some more extra controls for the more advanced users as well with upcoming updates. What I still haven’t mentioned regarding ShadowPlay is if ti supports recording of stereoscopic 3D gameplay videos as this is something that people playing on 3D Vision setups actually do need and can appreciate. Officially before the release of the ShadowPlay feature Nvidia did not say that it will have stereo 3D support, and now that the software is available still no official 3D Vision support. The good news is that ShadowPlay can actually already record stereo 3D gameplay videos, but with one important thing to note – the 3D video you get is also in 1920×1080 resolution meaning that it is essentially recorded in Half Side by Side format (half horizontal resolution per eye). Not that this is a bad thing compatibility wise, but it would’ve been nice if the user can select between Half SbS mode and Full Side by Side (maybe limitation of the hardware H.264 encoder?). FRAPS for example as the only other gameplay video capture software with stereoscopic 3D video recording support does only output in Full Side by Side format, but the major problem with FRAPS is that the video output is hardly compressed and recording 3D video does result in a lot of gigabytes per minute of recording. So to summarize things, the ShadowPlay feature is apparently intended for gameplay video recording of 2D gameplay, though it also supports 3D gameplay video recording in Half Side by Side format meaning that the two views are squashed in a single Full HD frame and FRAPS on the other hand produces Full Side by Side output when recording stereoscopic 3D video. ShadowPlay does output small H.264 compressed video files that are ready for online sharing, unlike FRAPS that produces multi-gigabyte files for each minute of recorded footage and recording 3D makes the files even bigger, s you need to re-compress them before uploading and sharing them. The performance drop when using ShadowPlay should be significantly less, because the hardware H.264 encoder of the video card is used to compress and output small files, unlike FRAPS where the CPU handles the minimal compression applied and the HDD/SSD needs to handle the serious load caused by the large amounts of data written each second, so the performance drop is more significant. FRAPS has more features and more controls for the more advanced users while maintaining ease of use by the normal user as compared to the way too user friendly and somewhat lacking features interface of the ShadowPlay. And now for some tests of ShadowPlay and a comparison with FRAPS when both are set to record video at 1080p 60 fps in various conditions in the game Battlefield 4. The game was chosen because it can be quite heavy even for the fastest GPUs when you up the graphical settings to the maximum as in the current case – Ultra Quality with 4xMSAA with a GeForce GTX 780 Ti video card. Battlefield 4 is not recommended by Nvidia to be played in stereoscopic 3D mode with 3D Vision, but it is still Ok for benchmarks and recording, so take a look at the interesting results below. As you can see from the results above, by using ShadowPlay you get to loose much less FPS compared to when recording video with FRAPS and also the output video’s file size can be significantly less. Aside from that you can probably notice that Battlefield 4 does not handle that well performance wise with 3D Vision enabled, even when it is not active you still get significant performance drop as compared to normal 2D mode and that is probably half the reason why the game has a Not Recommended rating for 3D Vision and the other half is the visual issues when rendering in stereo 3D mode. And one interesting observation that I made while testing was the fact that as long as 3D Vision is activated from the Nvidia Control Panel then when you record gameplay video with ShadowPlay you are getting a stereo 3D recording in Half Side by Side format, regardless if you have pressed CTRL+T to enable or disable the display of 3D data on the screen. So you need to be careful when you want to play and record gameplay video in 2D mode you will have to disable the 3D Vision stereoscopic 3D support form the Control Panel before running the game and for recording stereo 3D gameplay video the good thing is that you may not actually play in stereo 3D mode while recording in it. Nvidia Grid for Cloud gaming and bringing other new features such as support for tiled 4K displays (4K monitors look promising, but these require a lot more GPU processing power than Full HD). Not that this is a bad thing, but it seems that Nvidia is not very focused on 3D Vision and stereoscopic 3D gaming anymore, or at least this is the impression that we are getting. What we know for sure is that we’d hate to see 3D Vision following in the footsteps of the old stereoscopic 3D drivers that Nvidia had back in the day. If Nvidia is not actively working on their stereoscopic 3D game support as well as with game developers, we unfortunately cannot expect too much from AMD either as they were never that active into supporting stereo 3D gaming either.